"You can't do carpentry, you know, if you only have a saw, or only a hammer, or you never heard of a pair of pliers. It's when you put all those tools into one kit that you invent." We join screws in the wheels, but it is the hole in the wheel that drives the vehicle. Most great ideas are really combinations of other ideas. The simple secret of my genius is that I created something new out of the ideas and inventions of others. 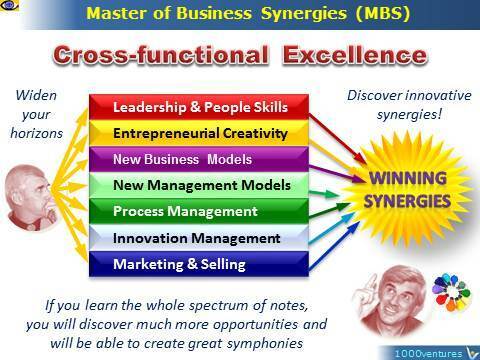 Why Do You Need Cross-Functional Excellence? "My poor dad said, 'You need to know a lot about one specialty'. Innovation is a pervasively cross-functional process. Although innovation is driven by technology, required competence extends beyond technical know-how. In the → new new knowledge economy and knowledge-based enterprises, → systemic innovative solutions arise from complex interactions between many individuals, organizations and environmental factors. The boundaries between products and services fade rapidly too. If you wish to be a → market leaders today, you must be able to integrate in a → balanced way different types of know-how that would transform stand-alone technologies, products and services into a seamless, value-rich solution. If you develop a broad cross-functional expertise, no new idea is wasted. It will immediately connect with the existing knowledge and inspire you, energize you, and encourage your → entrepreneurial creativity. The broader your net, the more fish you can catch. IT architects are in growing demand. They are cross-functionally excellent people who can "tie several silos of expertise together," relate to business problems as well as technology, and then sell their ideas upward and downward in the corporate hierarchy. The position of IT architect has become increasingly important to the ever-changing IT industry, and is one that established corporations and start-ups are seeking. "As IT positions become more specialized and include increasingly detailed responsibilities, there's a need for someone who can tie several silos of expertise together," says Al Volvano, a product manager for Microsoft's Learning Group. → Business e-Coach, a new-to-the-world product and the world leader in business e-coaching is a great illustration of the power of cross-functional expertise as a source of sustainable competitive advantage. The e-Coach integrates synergistically and systemically many various expertises to inspire innovation and entrepreneurial creativity. Launched in 2001 initially as a hobby and later on as a home business, it has today customers in 130+ countries. This global success has not created any direct competition to Business e-Coach however. Why? Because potential me-tooers had no cross-functional experts to be able to develop a competitive service and keep upgrading it continuously at high speed.